They say that “the eyes are the windows to your soul”. And no truer words have been spoken. Of all body language, how a person uses their eyes reveals their thoughts and emotions most accurately. If someone holds eye contact with you, it could mean that they find you attractive or interesting, or they are feeling anger or hostility towards you. It’s their pupils that tell you what they are feeling towards you. 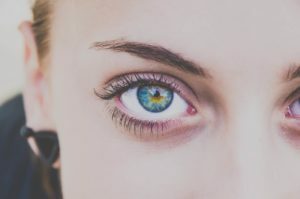 If the pupils are dilated (big) they are attracted to you or at least they find you, or what is being said, interesting and if the pupils are constricted (small) they are feeling anger or hostility towards you, or they disagree or find offence to what is being said. Studies have shown that you should hold your gaze or eye contact with the other person for about 60% – 70% of the time to build rapport and make the other person feel comfortable. More realistically, you should try to match the other person’s eye contact to be seen as an equal and make them feel comfortable. Letting your eyes wander from the other person’s eyes down their face and below their chin to other parts of the body shows that you are attracted to them. Obviously, you are checking them out. When socially interacting, focus your gaze on the triangular area between the other person’s eyes and mouth. If you concentrate on looking them in the eyes, it risks becoming a staring competition and the other person may feel uncomfortable. Dominant people use eye contact confidently. Their eye movements are slow, smooth and purposeful. They spend more time looking at the other person when they are talking and less time when they are listening. If you want to appear more dominant, hold your gaze just a little bit longer than normal.